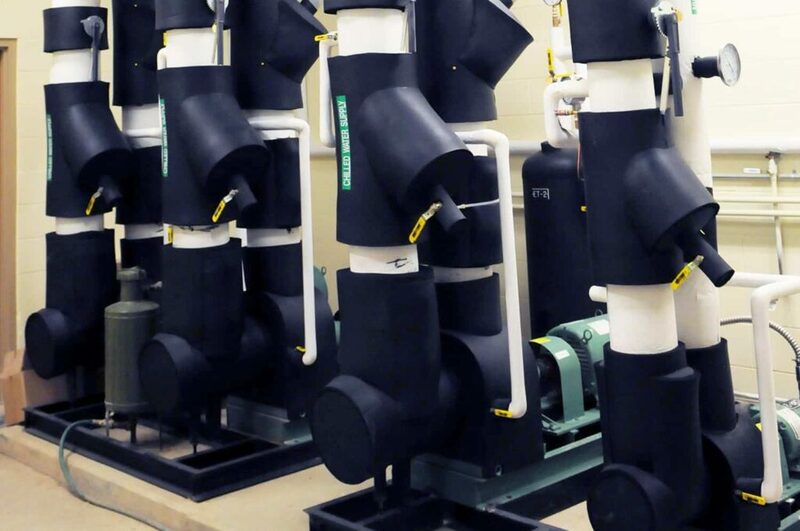 We’ve revolutionized how mechanical work is done. The TP Mechanical advantage is innovation, pure and simple. We’ve taken the mechanical fabrication concept, expanded on its capabilities and used it in ground-breaking applications that have transformed the role of mechanical systems in the commercial construction industry. We know the challenges of large-scale construction projects, and we’ve answered them with our market-leading, quality-driven fabrication process. Our design team offers unparalleled skill with sophisticated software to generate innovative, customized solutions for your primary challenges. 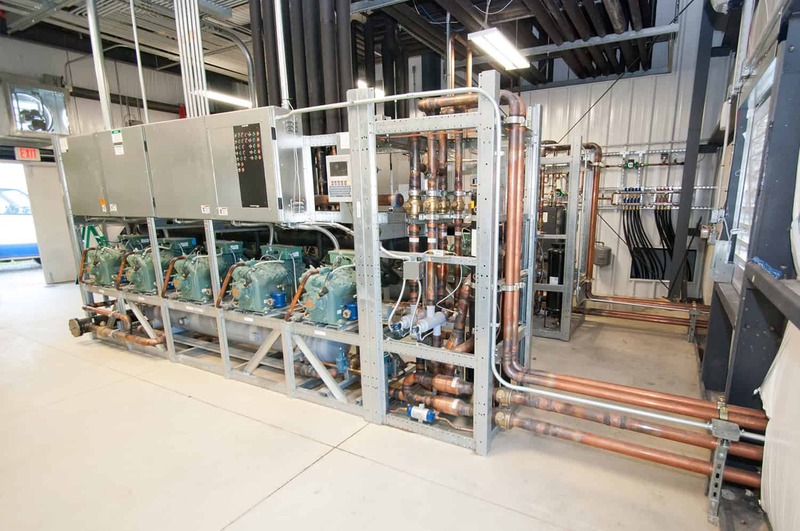 TP Mechanical is different from other contractors out there because we house a team of experienced, creative engineers and state-of-the-art software, technology and equipment all under one roof – a 45,000 square-foot fabrication facility built in 2009. 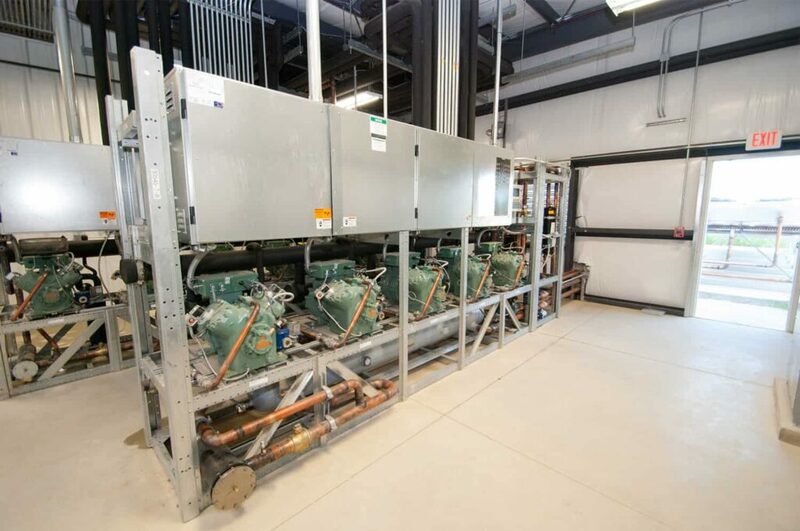 We build systems in our unique facility and controlled environment, accelerating your construction timeline, getting your doors open faster and allowing us to build every component with unparalleled precision. 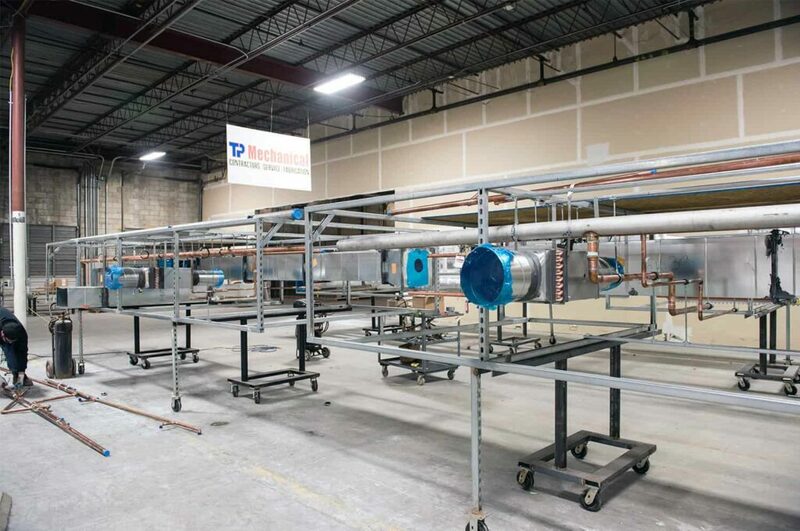 In addition to the fabrication facility, TP Mechanical opened three distribution centers – Cincinnati, Columbus and Lexington – totaling approximately 170,000 square feet. 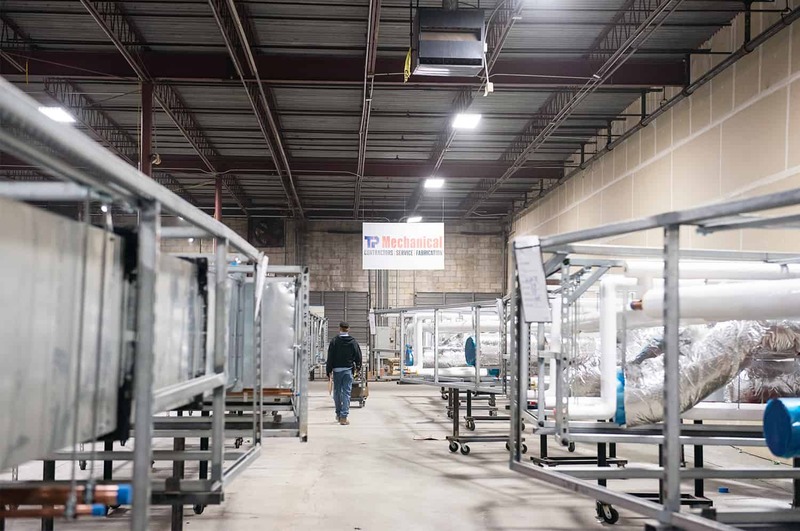 Our distribution centers provide a clean, controlled environment for our fabricated products, and an additional step in our quality-driven fabrication process. 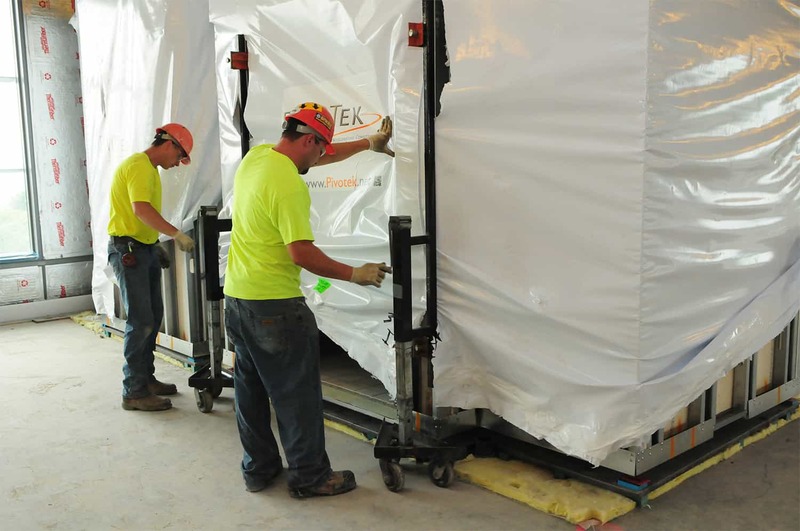 When a product leaves one of our distribution centers it is ready to be installed. It is free of any waste materials and on wheels for safe and easy transport on the jobsite. We also check for quality upfront, ensuring orders are accurate, full and delivered on-time with little jobsite disruption. Not only did we commit to building fabrication facilities, we committed to creating quality-driven processes by become ISO 9001:2015 certified. TP Mechanical earned this certification for the company’s Quality Management Systems for prefabrication, specifically for “prefabrication of components for the purpose of fast-track construction in the piping and mechanical plumbing fields.” The firm’s ISO 9001:2015 certificate is registered through EAGLE Registrations, Inc., and the ANSI-ASQ National Accreditation Board (ANAB). TP Mechanical was featured for safety and innovation in Construction Today. 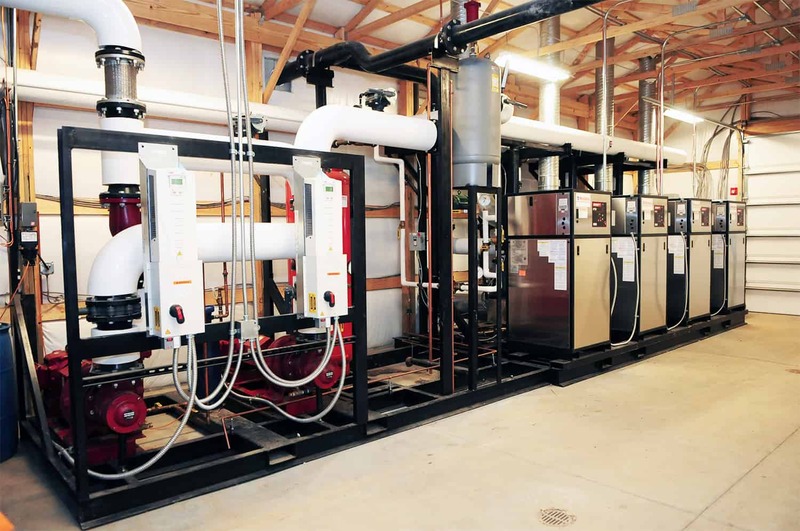 Take a moment to read ‘TP Mechanical Says Safety and Innovation have been the Bedrook of its Success‘ by Chris Petersen. TP Mechanical was highlighted in Construction Executive for our innovation and fabrication capabilities. You can read ‘A “Fab” Investment‘ by Joanna Masterson here. A prime example of the robustness and efficiency of our fabrication program is our work on the Miami Valley Hospital Heart Tower. 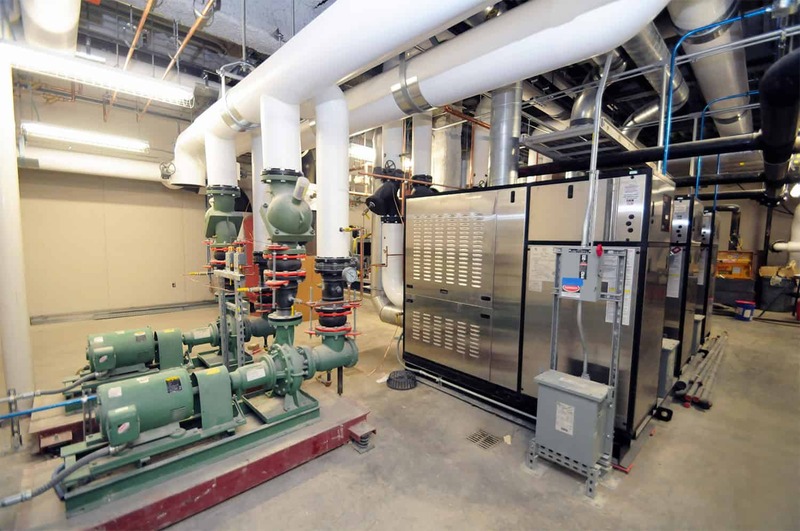 TP Mechanical was the plumbing and mechanical contractor with a design-assist contract on the 12-story Heart Tower addition to the main campus of the Miami Valley Hospital in Dayton, OH. The tower was constructed with six floors of cast-in-place concrete topped with structural steel and clad with a combination of precast and curtain-wall. The focus of the new tower is a comprehensive heart center featuring imaging services, cardiac testing, cardiac catheterization labs and heart surgery suites and includes a total of 178 private patient rooms. TP Mechanical recognized that it would be challenging to accommodate numerous employees and trades onsite and still meet the schedule. The management team travelled to Europe to investigate a proven prefabrication process that would reduce the manpower in the field and reduce installation time, and they observed a real-time application of the fabrication, sectioning, delivery and installation. The original design for the tower did not accommodate prefabricated racks. 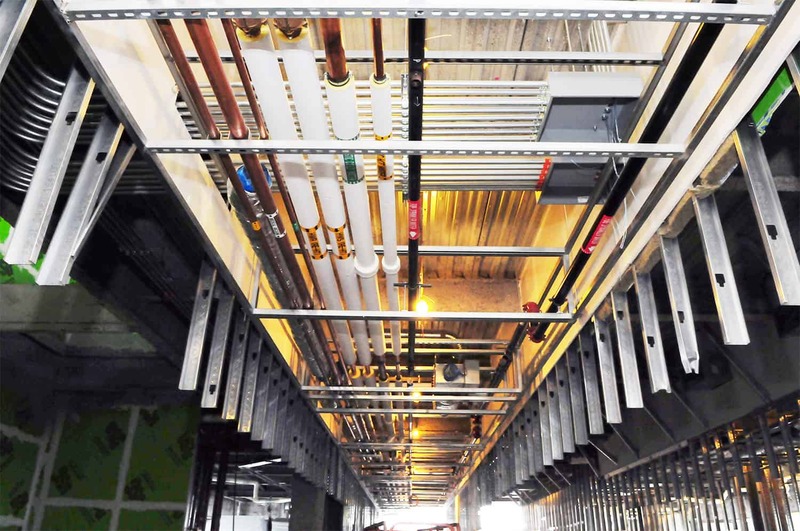 TP Mechanical proposed a redesigned corridor rack to include the other trades, and seismic cabling and bracing was included in the design to meet code requirements. 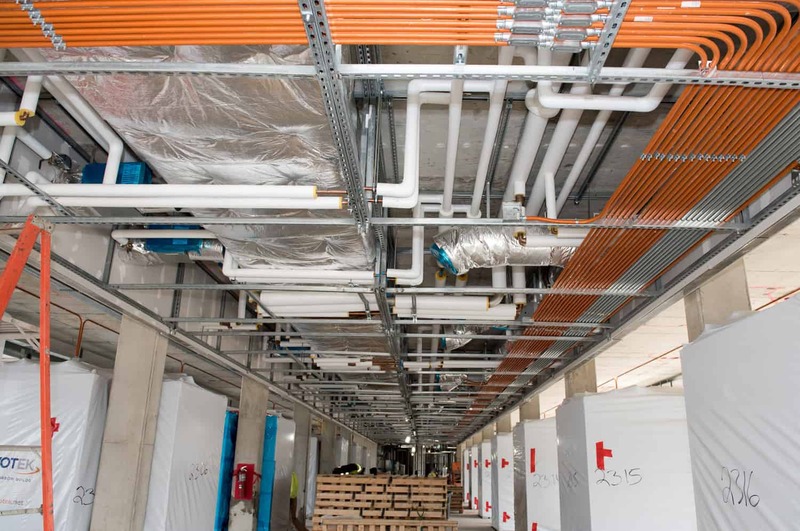 By prefabricating the corridor distribution systems and patient room bathrooms, we reduced the on-site manpower and installation time. This became the greatest benefit to the project. TP Mechanical prefabricated 120 different racks with more than 400 detailed drawings. The racks were installed and the project was successful with our innovative approach. 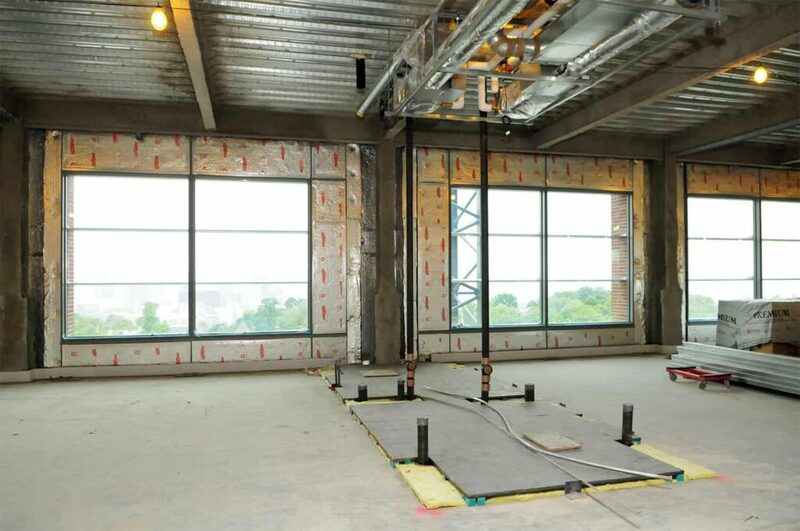 Read more about this project, and learn more about how fabrication plays a role throughout our entire project portfolio. Our process – from the ground up. Our highly-trained engineers skillfully utilize BIM and CAD technologies to customize designs according to your project needs and specifications as well as coordinate multiple systems in 2D and 3D fields. Collision-proof software ensures error-free drawings to help multiple field-teams install complex, integrated systems swiftly and reliably. Finally, we’ll provide you with accurate, up-to-the-minute pricing estimates as your project evolves. We’ve organized our fabrication department into specialized work groups. In these groups, each technician is highly trained in the production and assembly of an assigned unit or module, securing singular focus and attention to detail at every step of the process. Additionally, we’ve invested in high-tech automated equipment to ensure consistency and quality of every cut and weld made. Carrier groups are what we call sections of plumbing piping with fixture carriers included. We fabricate our carrier group assembly in-house so we can continue building our units in a controlled environment and prepare them for easy transport. Our carriers make it easy to set our units in place using a dolly or crane at the jobsite. 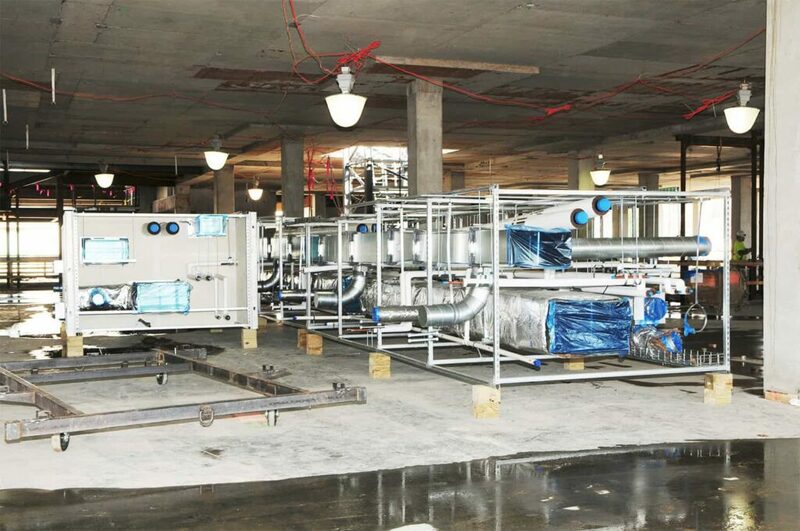 Before we pack up our units for delivery, we air-test all piping systems and ensure that they will meet local codes. As a result, we send detailed reports of results to the field with the units. 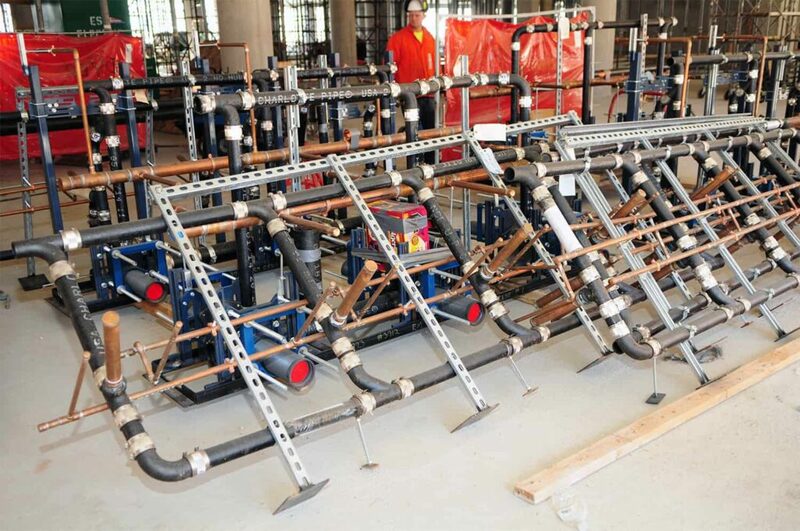 Pre-fabrication’s big advantage lies in that the team performs the bulk of the work prior to installation in the field. 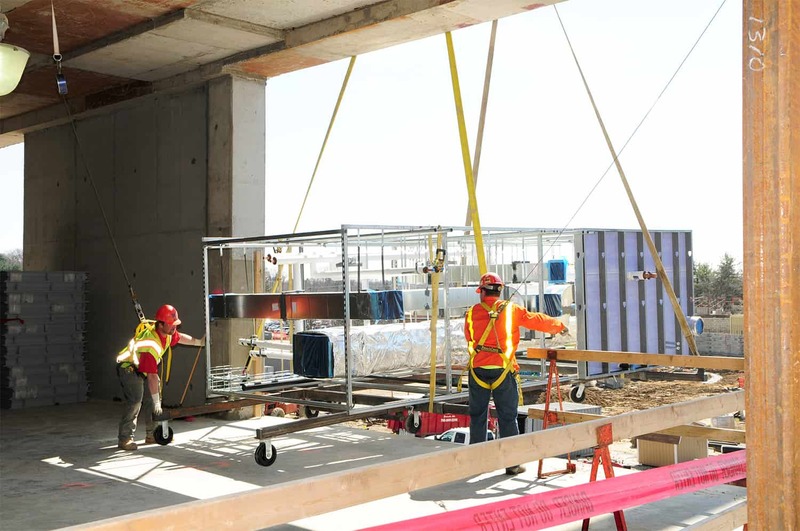 We assemble materials in our controlled facility on ground level, rather than requiring work at high elevations in awkward positions on the jobsite. In addition to improving safety, this minimizes on-site labor time and helps enhance the quality of the product. We can bundle materials and transport products in modules or units to simplify the process in the field. Because we’ve done most of the work before the product arrives at the jobsite, installation happens in record time.